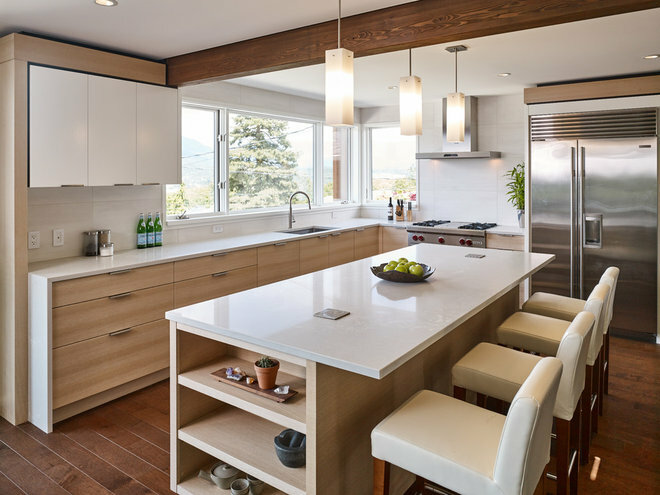 4 Storage Ideas For Your Kitchen Island - Jamie & Co.
A lot of attention goes into selecting the right storage for an island’s main base cabinetry. But don’t forget about the ends of the island. Depending on which way your island faces and how much space you’ve got in relation to the drawers and cabinets you select, you’ve got plenty of options for display and storage. Here are four ideas to get your creative juices flowing. Homeowners’ request: A 16-by-16-foot addition with a new kitchen and mudroom. 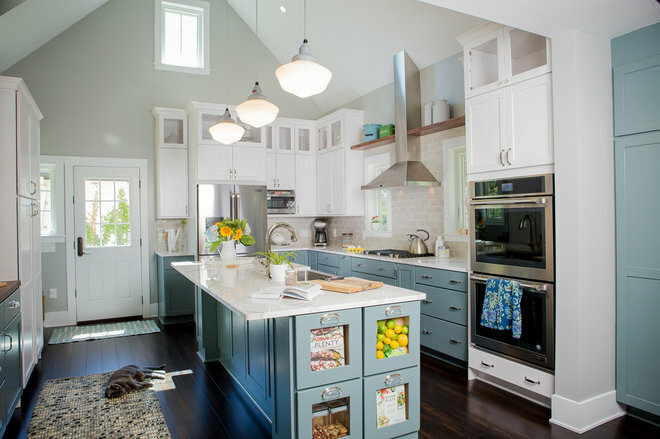 Island storage: Cabinets painted coastal blue with a marble-looking quartz countertop. Four glass-front drawers on end with glass cup pulls. The drawers have a false back with storage behind so the homeowners can display colorful fruit, candy, pasta, cookbooks and more. Other special features: Twelve-foot vaulted ceiling. Stainless steel apron-front sink. Dark stained bamboo wood floor. Custom pine shelves flanking the range hood, which help establish a clear end point for the backsplash tile. “Uh-oh” moment: During construction, the clients were concerned that the windows were too small and too few. 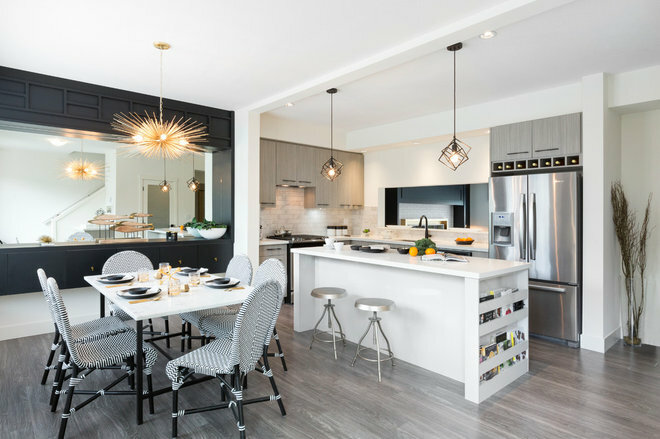 But once the light gray paint was on the walls and the white cabinets were installed, the space felt like it had ample natural light. Pendants with 8-foot-long cords help keep the light unobstructed. Homeowners’ request: A fresh look with more functional space and a layout that would work for a busy household. 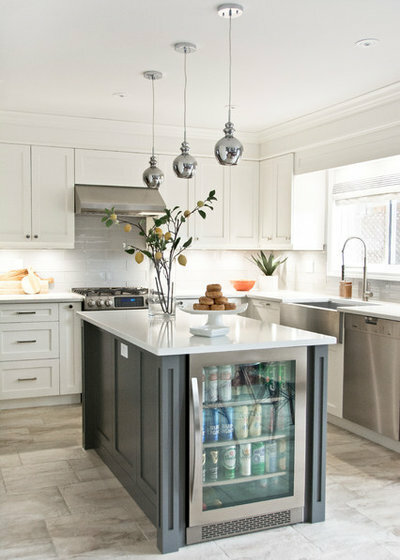 Island storage: A transitional-style island features a bar fridge that perfectly fits the available end space. Other special features: Shaker-style white cabinetry with an accent of charcoal gray (Benjamin Moore’s Kendall Charcoal). Large-format porcelain floor tile. Glass tile backsplash. Island storage: A quartz-topped island features a slim built-in cookbook holder that puts front covers on display. There’s also a wine fridge on the other end of the island. Other special features: Four-by-12-inch Carrara marble tile backsplash. Laminate flooring that looks like wood. Cutout over the sink that overlooks a downstairs living room. Homeowners’ request: A spacious renovated kitchen that would focus on surrounding mountain views. Island storage: A 4-by-10-foot rift-cut white oak island is topped with a Caesarstone counter (with pop-up electrical outlets) and bookended by two deep display shelves. Other special features: Blond wood cabinets. Porcelain tile backsplash. Designer secret: “With the decision to use glulam beams, we were able to hold the structural loads as well as create a more open space,” designer Leo Chester says.